I was reading Rachel Mankowitz’s blog post the other day and was immediately struck by a terrific closeup shot of her adorable little dog, Butterfly. I just had to try drawing her. I usually start with a preliminary sketch, but I was enjoying the subject and the sketching (and that Polychromos colored pencil) so much that I started adding more detail than I normally would. Then I realized there was a bit of an issue with the placement of one of the features, and decided to end the preliminary sketch. This dog is so sweet, though, that I just had to share it. I hope to try a more complete sketch of this sweetie sometime soon. Thanks for sharing, Rachel! It’s clear you really love your dogs and you take wonderful photos of them. I hope you got a smile from this! And I hope you did, too! It’s a great feeling to be sketching faces this year. I do believe I could do this every day and never tire of it! I hope your Tuesday brings you wags, woofs and laughter. Peace. Thanks so much, Tom! I’m so glad you think so! I tend to like these partial faces too, and then I wind up thinking that’s just goofy me. Really glad you’re enjoying as well! Thanks so much, Kerfe! Really glad to see you both saying that, because I was thinking it was just me. I am really grooving on partial faces, I think they’re really cool, but then I wonder…..what if I framed it? Wouldn’t it look bizarre at that point? But maybe not, if you both like it too! (I’ve always been a weirdo, so I question myself.) I appreciate your feedback! Not strange at all! A frame would be great. Oh – I can feel the HAPPY JOY!!!!!! Love it! It’s so the best! I’m flying everywhere these days, having so much fun with this! 💛💛💛 So glad you’re feeling it, Jodi! It multiplies the happiness! Okay…you know what I love about this one? The nose actually looks like if you felt it, it would be wet! Thanks, Kathy! That’s in part due to the texture of the medium itself! It’s something I never used to think about before, but the choice of medium can really make a big difference to the success of the picture. There’s a bit of oil (and maybe a bit of wax too) in the Polychromos pencils and so you do get a bit of shine. Glad you enjoyed this! I showed my Mom the drawing, without preamble, and she gasped. She recognized Butterfly right away! It’s wonderful! Butterfly is a Lhasa Apso (like a shih tsu) and Cricket is a Cockapoo (cocker spaniel/poodle mix), and they both love to make faces at me! They are so gorgeous! I used to be roommates with someone who had a Cockapoo. She was the sweetest dog ever! You’re a lucky fur momma, for sure. I may try one or both of them again, really enjoyed staring into her beautiful face. Thanks for sharing your wonderful photos and stories, Rachel! Thanks for the drawing. It really is beautiful! Nice. Lots of fur to work on and you have the values on the eye and nose perfect. Keep going! Thanks, Carmel, I’m so glad you like this one. 😀 I’ve finally found my “thing”, I think. A very cool feeling! I can’t stop! Dog noses are not easy to draw, you are mastering the nose! Very cool drawing today, Laura. Thanks so much, Sharon! I agree, they are tough. Hardest thing I’ve done this year is a dog nose. Practice is so important. Thanks for your kind advice – very helpful to focus on the features themselves. Such a cute face! The eye & nose look great! Thanks so much! Eyes are my favorite things to draw! Glad you enjoyed it! 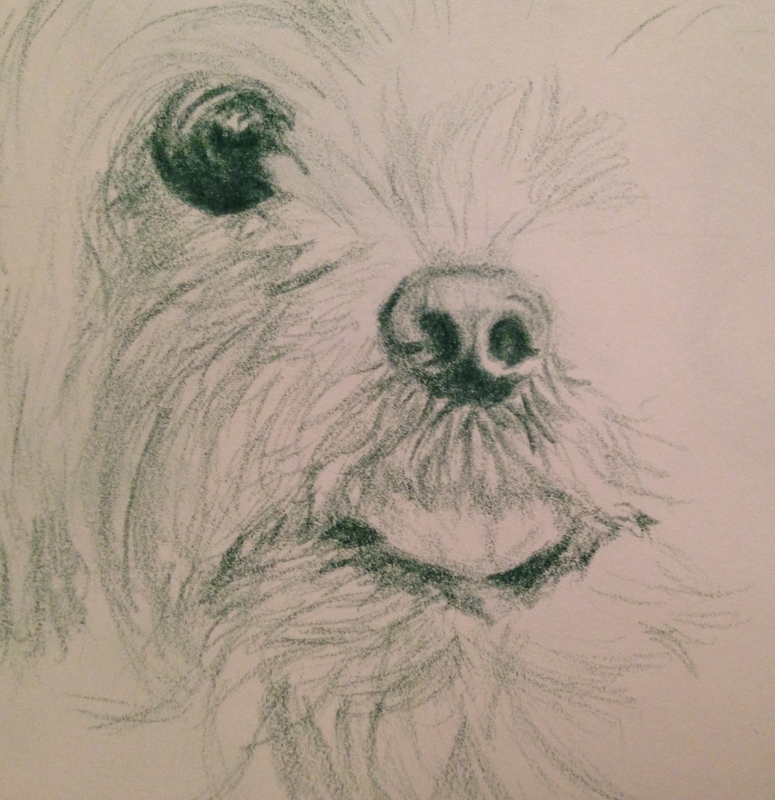 Like the close up drawing of dog and the partial drawing, give an edge of suspense/interest to drawing. The face is so sweet. Great job! Thanks, Laura! Glad you enjoyed it! I had a terrific photo to work from. Huge plus! Thanks so much, Teri! I’m starting to really like partial faces! Aww, thanks Teresa! I’m so glad you like it! I couldn’t resist sharing this. Such a sweet little face :-)! Reminded me of little Oscar. Heart-melting, irresistible, fluffy-dog sweetness. Way to bring your subject to life! Thanks, Myriam! She really was a joy to draw. White and black present extra challenges. I still haven’t mastered black! I love this cute little face! Glad you enjoyed it. leaving bits for the viewer to imagine, engages ! this is Perfect! great zoom in, expressive +, well done!!! Thanks so much, Debi! I’m glad you’re finding this expressive. I thought I would have to go more wibbly-wobbly with my marks (which I’ve not really graduated to yet) before I’d reach that point. Yay! Thanks, Debi, for the encouragement! I actually really like the partial faces! Not sure if others would consider that art and frame it, but I really like it (however, I’ve always been a weirdo, so who knows lol)! I’m so glad, Donna! Thanks! You have captured some real mischief here Laura, the nose is extra realistic. Thanks so much, Denis! Noses on dogs, I find, are the hardest. I appreciate your comment! Thank you, glad you enjoyed this one. I’m loving dogs as subjects! So cute, and love the hair! Another beautiful sketch Laura – your composition is intriguing and works perfectly. Thanks, Mary! This is one I just didn’t want to put down. Such a sweet photo I just could not resist it. So glad you liked it! Thanks so much, Jill! This dog was a delight to draw. As you say, you can just really tell she is one happy little girl, and I’m glad you can see that in the drawing too. I’m loving drawing animals and people; finally feeling like I’m doing what I’m “meant” to do in this art world. Thanks for your comment!